Now you should see your DAC in qjackctl. Configure your Linux box to load HiFace module every time you boot your PC. 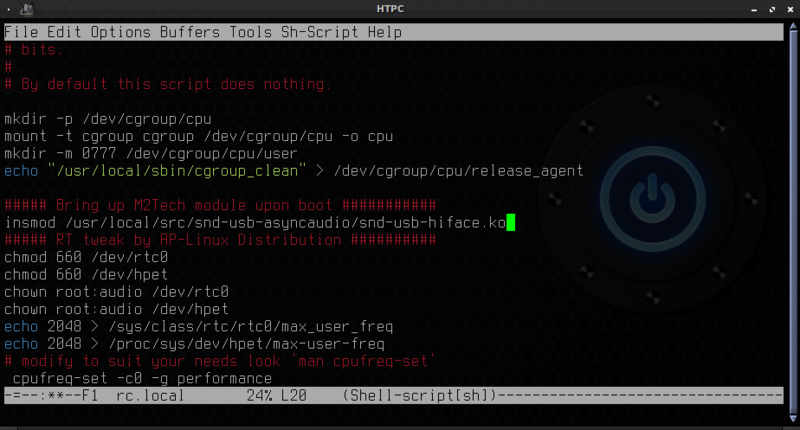 With insmod command you have loaded snd-usb-hiface.ko module in the kernel. But after reboot this module will be lost. So you have to tell Linux to load HiFace module every time you start your PC. You can do this with this method. With your favorite editor add this to /etc/rc.local file. To save: CTRL+x+s (press Ctrl, then holding the Ctrl press x and then s.
Reboot the PC and enjoy the music. I’m failing at the first step; when I do the command line for apt-get install git, I get an error msg “could not resolve debian.linuxmint.com”. When I try to use the commands for update or fix missing, I get other errors (eg system could not handle swap). I see you are using 3.2.11 kernel. Try to install linux-headers-3.2.11 package. Thank you, seems logical to me, but how can I do it when using ipkg? In Debian based distributions we use ‘apt-get install’. The linux-headers-3.2.11 is just a short name of for example linux-headers-3.2.0-38-generic-pae or such. If you don’t know how to use apt-get switch to XFCE and use ‘synaptic’ program for graphical install of packages. There you have search option. Find headers for your kernel and install it. I don’t know why you just don’t use our 3.6.10 kernel. We test it with Hiface and it works perfectly. apt-get is not working on my Synology 712+ NAS. I am trying to use ipkg instead, but cannot find the linux-headers, nor build-essential packages. Any idea how to install them on my Synology? Sorry I thought that you are talking about AP-Linux. Can’t help you with hardware that I don’t know. But I once had Synology for few days and I can tell you that it was very painful to install anything on that. If you manage to do it, I will buy you a beer :-). My advice to anyone having this type of hardware is: Don’t use it for playing music. Use it as a network storage, and share files with NFS. And play music on real Linux or FreeBSD OS. I just repeated the process right now (fresh install, and copied the whole process from the web). Have no errors. You must did something wrong. Does this procedure also work for the normal HiFace (not the Evo)? Installed without a problem on 2 computers but on a third one I get an error inserting the module in the kernel: unknown symbol. Tried three new installs but with the same result. Latest version aplinux. Does it make a difference if hpet is enabled in BIOS? Try to change settings in BIOS. This might help. At the last command “make” it fails by telling me that No Such file or directory. Stop. Is there anything else to do in order to make the Hiface visible?? make: *** /lib/modules/3.2.32-rt48/build: No such file or directory. Stop. You didn’t do it right. Follow step by step. How can I make my hiface 1 the “default interface” so I can change and experiment with the others drivers (oss, etc) in jack. Do you have a procedure to install m2tech hiface evo in v3.x? Does this mean it *cannot* be done? If really impossible that would be very bad news for the high-end streamer I am working on, since APlinux is so highly regarded! As I said before. We tried to contact M2Tech few times before but they didn’t respond. So if you need support for M2Tech products, ask them.